We've been growing and moving trees for 3 generations. 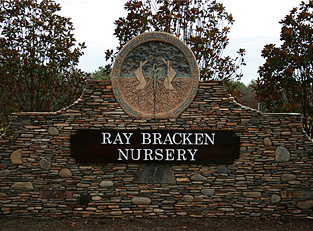 The Bracken name has been synonymous with the nursery business since the 1930's. 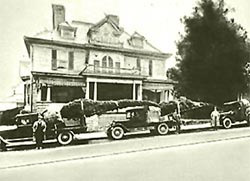 As the photo shows, Albert T. Bracken was moving big trees even then. Today, we have combined those years of experience with modern up-to-date equipment and technology to produce top quality landscape plants. One such quality plant is our patented Magnolia grandiflora - 'Bracken's Brown Beauty' (PP#5520). 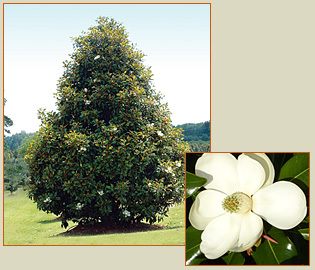 It is the finest Magnolia ever developed, having dense habit form from the ground to the top, producing a compact pyramidal-oval crown with a fast growth rate. It is ever-blooming, but the heaviest is in the Spring and Fall, easily transplanted and retains dense foliage with brown back. Click here to see all the Magnolias. We look forward to serving the future plant needs of our customers and invite inspection of our operation. To insure that someone will be available to show you around, please call ahead for an appointment. North Carolina Nursery & Landscape Assoc. Tennessee Nursery & Landscape Assoc.